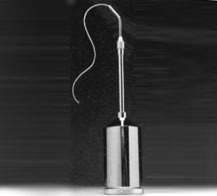 The thread passer provides an efficient method of passing thread under any vessel for ligating. Pass the “threader” under the vessel, grasp the loose end of the thread, withdraw the passer to desired length of thread and cut off with built-in shearing blade. The new spool is easily replaced on a stud inside the friction cap. The threading snare provided is merely pushed down the feed tube from the operating end and the thread place in the snare loop and then withdrawn. The blade is easily replaced if needed. Comes with snare, extra blade and two spools of thread. Approximately 4” Working Length.